Edward Colimore offers a piece in the Philaelphia Inquirer on a WWII medic who served with the allied invasion forces on D-Day. A few blocks from his Margate, N.J., home, the beach is busy with vacationers baking in the sun, playing in the waves. But when Bernard Friedenberg closes his eyes at night, he sees another sandy shore - a nightmarish place 3,000 miles away that won't let him go, not even after 72 years. 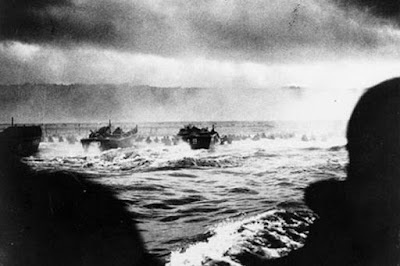 Friedenberg tosses and turns in his sleep, he repeats military jargon, and tries to jump from his bed, as if again exiting the landing craft that brought him to Omaha Beach on D-Day, June 6, 1944. The Army medic's lifesaving "work began" the moment he crawled out of the surf - and onto the killing ground that was Normandy, France. "Everywhere I looked I saw dead and wounded," said Friedenberg, who was a staff sergeant. "I could hear men hollering 'Medic' from every direction." Amid exploding shells, machine-gun fire and unimaginable carnage, he "moved on to the next casualty and then the next and the next and the next," he said. "There was no end to them." Friedenberg, 94, a South Philadelphia native, is one of the ever-shrinking number of World War II veterans who witnessed the tragic losses and heroic self-sacrifice of D-Day - the beginning of the end for Adolf Hitler's Third Reich.